Since spring 2015, the number of Americans who think global warming is happening has increased by seven percent. 70% now say it’s happening. This figure nearly matches the highest level we’ve measured (71%) since we began conducting our surveys in November 2008. Worry about global warming is also on the rise, with a larger majority (now at 58%) saying they are “somewhat” or “very” worried about the issue. The increase is driven by a five percent uptick since last spring in people who now say they are “very worried” about global warming. Americans increasingly view global warming as a threat. Since last spring, more Americans think it will harm people in developing countries (63%, +10 points), people in the U.S. (59%, +10 points), future generations (70%, +7 points), and themselves personally (41%, +5 points). A record high 38% of Americans think people in the U.S. are being harmed “right now” (+6 points). 70% of the American public now says global warming is happening. 58% of Americans are "somewhat" or "very" worried about global warming, with a 5-point increase in the "very worried" (now at 16%). A record high 38% of Americans think people in the U.S. are being harmed "right now" (up 6 points since spring 2015). By a three-to-one margin, Americans support (76%) rather than oppose (23%) teaching children about global warming in school. This report is based on findings from a nationally representative survey—Climate Change in the American Mind—conducted by the Yale Program on Climate Change Communication (http://climatecommunication.yale.edu/) and the George Mason University Center for Climate Change Communication (http://www.climatechangecommunication.org). Interview dates: March 18–31, 2016. Interviews: 1,204 Adults (18+) who are registered to vote. Average margin of error: +/- 3 percentage points at the 95% confidence level. The research was funded by the 11th Hour Project, the Energy Foundation, the Grantham Foundation, and the MacArthur Foundation. Leiserowitz, A., Maibach, E., Roser-Renouf, C., Feinberg, G., & Rosenthal, S. (2016). 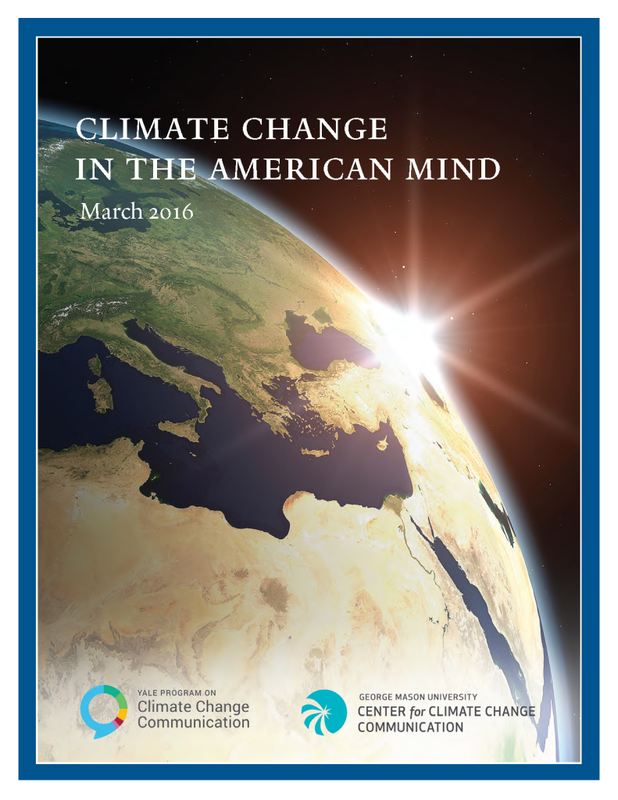 Climate change in the American mind: March, 2016. Yale University and George Mason University. New Haven, CT: Yale Program on Climate Change Communication. The research and report was funded by the 11th Hour Project, the Energy Foundation, the Grantham Foundation, and the MacArthur Foundation.